I probably would not have considered Brussels sprouts for breakfast had it not been for chorizo. Good old Mexican chorizo (beef or pork) is a sausage made with spices like garlic and paprika and of course powdered chile. While chorizo has a number of applications we love it for breakfast dishes like chorizo con huevos and papas con chorizo, but also mixed in beans, cheese (queso fundido), meatballs and even as fillings for empanadas. On the other hand, Brussels sprouts on the surface don’t feel as versatile. But, that’s where you are mistaken my friends. Taking a cue from restaurant dishes that always seem to pair the sprouts with bacon, which is darn delicious, I looked in my refrigerator and grabbed for the chorizo. The pair just sounded like it would be a good match, and I was right. 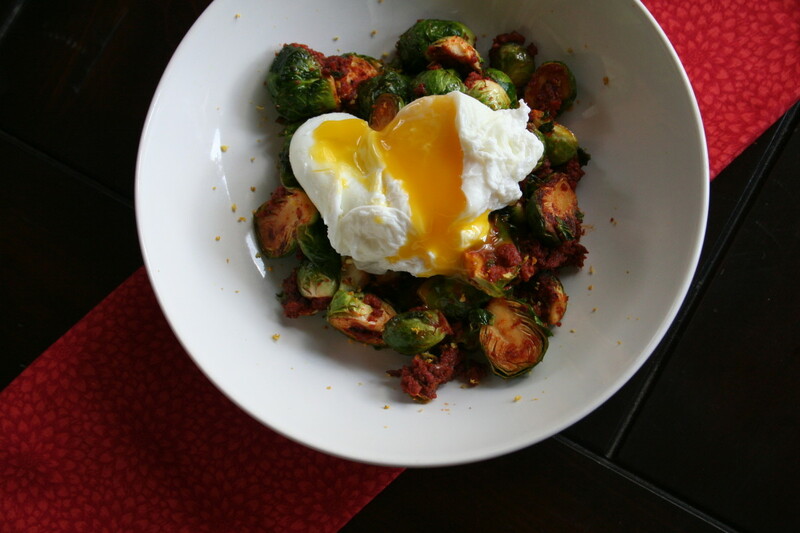 Take a chance on these notoriously bitter sprouts and pair them with spicy, fatty Mexican chorizo for an unexpected breakfast, lunch or brunch dish. 1. Trim the stem-end of the sprouts. Cut them in half. 2. In a large heavy skillet, cook the chorizo over medium heat. Break up the sausage with a wooden spoon, stirring occasionally until cooked through, about 5-8 minutes. Place on paper towels to drain. 3. Drain all but 2 tablespoons of pork fat from the pan, or you can add some olive oil if needed. Add the Brussels sprouts, zest and juice and cook over medium-high heat until cooked through and browned on both sides. Careful not to over cook the sprouts because they can get mushy. 4. Return the chorizo to the pan and mix thoroughly. Season with salt and pepper. 5. To serve, sprinkle more lemon zest and top with a poached egg.